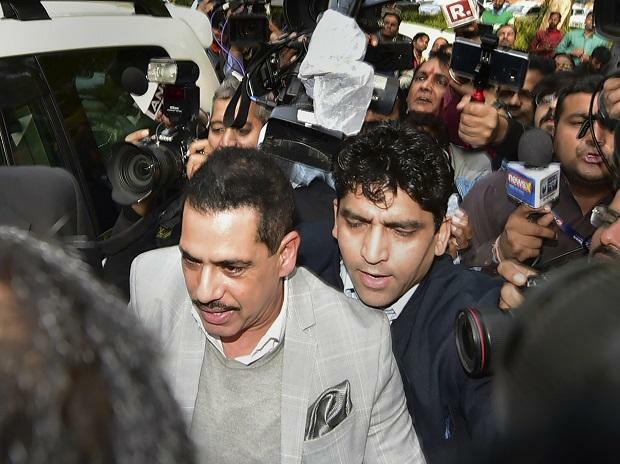 Robert Vadra's interim bail was Saturday extended till March 2 in a money laundering case by a Delhi court which asked him to join the probe whenever asked to, after the Enforcement Directorate (ED) alleged that he was not cooperating in the matter. Vadra, who appeared in court, sought extension of the interim bail after the ED requested for more time to file a reply to his anticipatory bail plea. Special judge Arvind Kumar granted the relief to Vadra, the brother-in-law of Congress president Rahul Gandhi, and said the interim orders of protection from arrest will continue till the next date of hearing. The court also extended the protection from arrest granted to his close aide and co-accused in the case, Manoj Arora, till the next date of hearing i.e., March 2. ED's Special Public Prosecutors D P Singh and Nitesh Rana told the court that it needed to question Vadra in the case and opposed his anticipatory bail plea, saying that he was not cooperating in the case. The agency also said that Vadra has been summoned for further questioning on Tuesday. "Vadra is not cooperating and giving evasive replies," Nitesh Rana told the court. The businessman, represented through senior advocate KTS Tulsi, however, denied the charge and said he was ready to come for questioning as and when called. "The counsel submitted that the applicant Robert Vadra has already joined the investigation and has cooperated during the investigation. Counsel submitted that applicant will join investigation as and when directed by the investigating officer and is ready to cooperate. Under the facts and circumstances, applicant is directed to join the investigation as and when called by the IO," the court said. Singh told the court that Vadra is accompanied by a 'baraat' (wedding procession) wherever he goes, whether to the agency office or to the court. "There are some people who always come with a 'baraat', Vadra is one of them," he said, adding that by 'baraat' he was referring to the media. The lawyer alleged that Vadra was using social media, including Facebook, for writing about the case and highlighting the matter. The agency had earlier said it has received information about various new properties in London which allegedly belong to Vadra, including two houses of five and four million pounds, each, six other flats and more properties. In his anticipatory bail plea, Vadra had alleged that he was being subjected to "unwarranted, unjustified and malicious criminal prosecution which on the face of it is completely politically motivated and is being carried out for reasons other than those prescribed under law". The plea had said Vadra's office was raided by the ED on December 7, 2018 and, therefore, he seriously apprehends that his liberty may be curtailed by the investigating agency. "The petitioner (Vadra) is being subjected to a farce criminal prosecution which actually is beset with nothing else except political vendetta and most unfortunately the respondent (ED) being the law enforcement agency is a party to the unethical and illegal exercise. "It is stated that the petitioner's (Vadra's) firm through its authorised representative Manoj Arora has already joined investigation with the ED conducting investigation into the affairs of the firm in Rajasthan with their offices at Jaipur on many occasions and has supplied all the relevant documents to the satisfaction of the officials of the ED," the plea had said. Arora, an employee of Vadra's Skylight Hospitality LLP, was a key person in the case and he was aware of the latter's overseas undeclared assets and was instrumental in arranging funds, the ED had alleged. Vadra had alleged that he is being "hounded and harassed" to subserve political ends. "It is stated the the petitioner has highest regard for the due process of law and is always willing to cooperate with the investigation. In the highly charged political atmosphere and political contours of the present investigation, he seriously apprehends arrest by the investigating authorities," his plea read. Arora had alleged before the court that the case was foisted on him by the NDA government out of "political vendetta". However, the ED had refuted the allegations, asking that "should no authority investigate any political bigwig because that will be called a political vendetta?" The agency had told the court that it lodged the money laundering case against Arora after his role came up during the probe of another case by the Income Tax Department under the newly enacted Black Money Act and tax law against absconding arms dealer Sanjay Bhandari. It had alleged that the London-based property was bought by Bhandari for GBP 1.9 million and sold in 2010 for the same amount despite incurring additional expenses of approximately GBP 65,900 on its renovation.